A storm is any disturbance in Earth's atmosphere with strong winds accompanied by rain or snow and sometimes thunder and lightning. Storms have a generally positive effect on the environment and on human societies because they are the source of most of the precipitation on which the planet depends. The most common violent change in the weather is the thunderstorm. In the United States, thunderstorms usually occur in the late spring and summer. Thunderstorms are rare in the parts of the country where the air tends to be colder, such as the New England states, North Dakota, and Montana. They also are rare by the Pacific Ocean, where summers are dry. The southeastern states tend to have the most thunderstorms. Some parts of Florida experience thunderstorms on a average of 100 days a year. A thunderstorm may last up to two hours, but most thunderstorms peak after about 15 to 30 minutes. Thunderstorms develop by the same process that forms cumulus clouds, the puffy clouds of summer skies. These clouds form when a humid air mass (air with an abundance of water vapor) near the surface rises on currents of air called updrafts. As the air mass rises through the atmosphere it expands and cools. Eventually, the rising air cools to the point where its water vapor condenses to form droplets of liquid water, releasing heat in the process into the surrounding air. This latent heat, in turn, causes the air mass to rise ever more quickly. The upward movement of air in a storm cloud has been measured at more than 50 miles (80 kilometers) per hour. As the upward movement of air continues, more moisture condenses out of the air mass and the suspended droplets form a large cloud. Depending on atmospheric conditions, a storm cloud of this type may rise to a height of anywhere from 6 to 9 miles (10 to 15 kilometers). In the clouds of colder climates, droplets may freeze to form ice crystals, which grow as more and more water vapor condenses on them. The droplets or ice crystals only grow as long as they can be supported by the updrafts. When they grow too large they begin to fall out of the cloud as drizzle or raindrops. Latent heat: The heat given off when water vapor condenses to form liquid water. Riming: The freezing on contact of raindrops as they collect on an ice pellet growing to a hailstone. Updraft: Any movement of air away from the ground. If the updrafts in the cloud are vigorous enough, much larger precipitation will be formed. In a severe storm, some of the ice crystals may be dragged down by the downdrafts, then swept up again by updrafts. Ice particles may be circulated several times through the storm cloud in this manner, picking up water with each cycle. In a process called riming, raindrop water freezes onto the ice particles, eventually producing large hailstones. Hailstones continue to be recirculated through the cloud until they grow large enough to fall out under their own weight. If located in the right part of the storm, hailstones can grow to impressive sizes. Hail as large as 5.5 inches (14 centimeters) in diameter has been recorded. Another product of the vigorous up and down drafts in the storm cloud is lightning. Lightning is a giant spark caused by a buildup of static electrical charges. By processes that still are not fully understood, thunderstorm clouds build up a large concentration of positive electrical charges near the top of the cloud and negative electrical charges near the middle. Usually the cloud base has a smaller pocket of positive charge. These opposite charges result in huge voltage differences within the cloud and between the cloud base and the ground. The opposite charges are strongly attracted to each other and when the air between them can no longer keep them apart, a discharge takes place—a bolt of lightning. Depending upon the location of the opposite charges, lightning can occur as cloud-to-ground lightning, cloud-to-cloud lightning, or cloud-to-air lightning. The temperature of a lightning bolt exceeds 40,000°F (22,000°C). The surrounding air is superheated, causing it to expand and then contract rapidly. This expansion and contraction produces the sound vibrations heard as thunder. It is possible to calculate how far away a storm is by counting the seconds between a lightning flash and a thunder clap. Since it takes thunder about 5 seconds to travel 1 mile (3 seconds to travel 1 kilometer), simply divide the counted seconds by 5 to determine the miles (by 3 to determine the kilometers). Normally, thunder cannot be heard more than 20 miles (32 kilometers) away. I thought the electrical discharge of lightning was caused by the collision of ice crystals in the clouds,which in turn knocks off negative electrons from the ice crystals that form at the bottom of the cloud.Very interesting article.I have always been fascinated by thunderstorms. This was really helpful! I had to write a BCR about thunderstorms and why it was dangerous and this website just gave me all the answers. I know I should have been listening in class but I didn't understand any of it. Thanks a lot! Very informative and clear. This really helped me in my science project. Keep up the good work! this website helped me get an A+ on my biology project thanks!!!! Thank You so much for helping me on my science project weather might do good cause you. this was very helpful to me because this stuff intrests me very much..so ya thanks for this information i loved it! i am learning about storms in my science class and I'm doing home work and i was using this sight because it tells me every thing i need to know about storm. 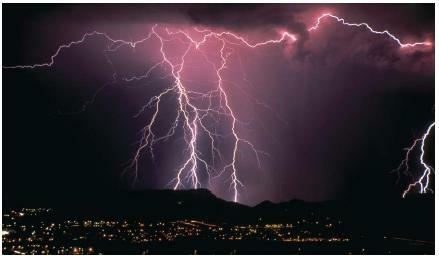 Thanks alot for helped me in my homework.I got more information about thunderstorm so keep up the good work. What part of the thunderstorm would you expect to get freezing rain? hey thanks this is a really good website for projects or if your just interested! How do the positive and negative charges in the cloud separate in the cloud? Aren't they supposed to attract? BTW, this website is very informational. Thanks.